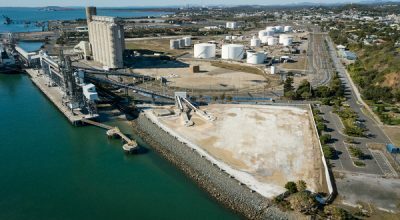 A CARGO of desi chickpeas loading this week at the Queensland port of Gladstone and bound for Bangladesh is expected to be the last bulk shipment from Australia’s 2018 chickpea crop. At around 220,000 tonnes, it was the smallest crop by far in recent years because of drought in Queensland and northern New South Wales where the bulk of Australia’s chickpeas are grown. The 20,500t cargo is made up of 10,500t from COFCO and 10,000t from JK International. “The peas were bought some months ago, and this will be the last one for the time being,” COFCO trader Rob Brealey said. In February, Graintrend, along with some other exporters, loaded 18,500 tonnes of chickpeas in Mackay bound for Bangladesh as the only other new-crop shipment of the pulse out of Central Queensland (CQ). “There is not enough quantity from CQ for another vessel, and no bulk chickpeas have gone out of Brisbane or Newcastle from last year’s crop,” Graintrend director Sanjiv Dubey said. CQ’s two bulk shipments, plus some tonnage road-freighted south for container export out of Brisbane, are thought to have reduced its unsold surplus to a few thousand tonnes at most. Anzac Day normally marks the start of Australia’s chickpea-planting period, with CQ the first region to kick off the seeding program, while the Liverpool Plains can plant chickpeas as late as early July.